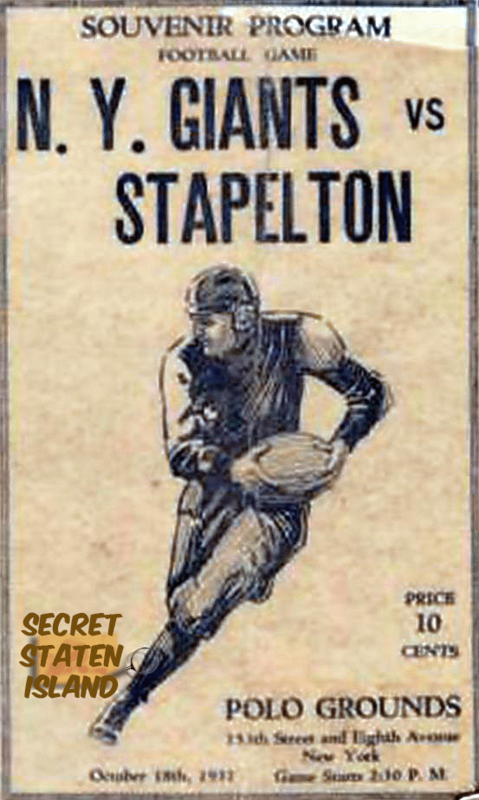 The Staten Island Stapletons, also known as the Staten Island Stapes, was a professional American football team founded in 1915 that played in the National Football League from 1929 to 1930. The team was based in the Stapleton section of Staten Island. Under the shortened nickname the “Stapes” they played an additional two seasons from 1931 to 1932. Jack Shapiro, who was a blocking back for the Stapletons, was the shortest player in NFL history. The team was based in Staten Island, New York. The Staten Island Stapletons were originally founded in 1915 as a neighborhood team. The team was organized by Dan Blaine, who also served as the team’s halfback. Blain later became rich by building up a chain of restaurants. The Stapletons played similar semi-pro neighborhood teams from the New York City area. During those early years, the Stapes played more for fun than money. Crowds were small and player salaries averaged $10 per game. The team won several local semi-pro titles before World War I. The team was inactive in 1918, due to Blaine’s service commitment to the military and involvement in the war. However, the team was renewed in 1919. By that time, Blaine was the team’s sole owner. He retired as a player in 1924 but continued as owner and manager of the Stapletons, who were commonly known as the Stapes. By that time the team set up Thompson Stadium, a cozy minor-league park in the neighborhood that gave them their name, as their permanent home field. Today the stadium site is occupied by Stapleton Housing located between Broad, Hill and Warren Streets and Tompkins Avenue. Prior to moving into Thompson Stadium, the Stapletons played in two temporary local parks: Stapleton Field and East Shore Oval. In 1924 the Stapes claimed the New York Metropolitan championship by beating the best independent pro teams in the area. However, in 1925, Tim Mara formed the New York Giants who moved into the Polo Grounds. The Giants presence in New York overshadowed the Stapes, particularly with the sell-out visit by Red Grange and the Chicago Bears on December 6, 1925. The Giants and Stapes began their New York rivalry on Thanksgiving Day 1925. The Giants defeated the Stapes in an exhibition game 7-0. After they rolled up a 10-1-1 record in 1928, Blaine applied for an NFL franchise in 1929. He needed permission from Tim Mara, the owner of the Giants, because Staten Island was in Mara’s exclusive territory. But Mara actually had an extra franchise. It had originally belonged to the Brooklyn Lions and had been given to Mara when the Lions folded in 1927 because they owed him money. Mara had then allowed the New York Yankees, owned by Grange’s manager C. C. Pyle, to use the franchise when that team moved from the defunct AFL into the NFL. The Yankees went out of business after the 1928 season, so the franchise again went back to Mara and he passed those franchise’s rights on to Staten Island. Blaine promptly hired Ken Strong, who became a Stapletons Hall of Famer. Strong, who received All-American honors while at New York University, was a speedy, powerful runner who was also one of the best kickers of the era. The Stapletons would never have a winning season in the NFL. During their first NFL season in 1929, the team went 3-4-3, defeating the Dayton Triangles, Brooklyn Dodgers, and the Minneapolis Red Jackets. They also managed to tie the Frankford Yellow Jackets once and Orange Tornadoes twice. The team improved to a 5-5-2 record in 1930. That season the Stapes managed to defeat the rival New York Giants 7-6, after a four-yard touchdown run from Doug Wycoff and an extra point kick from Strong. In July 1931, the team’s official name on the league records was changed from the Stapleton Football Club, Inc., to Staten Island Stapes. At this time, Doug Wycoff left the team to rejoin the Giants. In need of a coach, Blaine hired Hinkey Haines, who had played briefly for the Stapes in 1929. The Stapes opened at home by beating the Dodgers 9-7 before 7,000 fans. However, a week later at Ebbets Field, the Dodgers forced 3 interceptions to defeat the Stapes 18-6. The team would post a 4-6-1 record in 1931, defeating the Giants (once), Dodgers (twice) and the Cleveland Indians. In 1932, the Stapes finished dead last, defeating only the Giants and the Chicago Cardinals. Blaine was allowed by the NFL to suspend league play for the upcoming 1933 season. The team continued to lose money in 1933. While the team posted losses against the Giants, Dodgers, Portsmouth Spartans, and Green Bay Packers, they did manage to defeat the newly established Philadelphia Eagles. Doug Wycoff and Bob Campiglio stayed with the Stapes in 1933, but their star player Ken Strong signed with the Giants and helped them win the NFL Championship that season. Blaine went through the formality of getting NFL permission to suspend league operations for the 1934 season. The team played one more season of semi-pro football in 1934 before quietly folding a year later. On June 1935, Blaine’s franchise was finally declared forfeit. The franchise’s failure can be blamed to a combination of the Great Depression and having too small of a stadium that could never accommodate enough fans to make the team profitable. Therefore, Stapes fans couldn’t afford enough tickets to make a team possible.